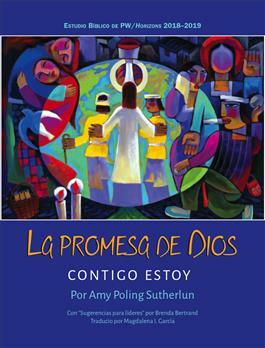 The 2017–2018 PW/Horizons Bible study, God’s Promise: I Am with You, by Amy Poling Sutherland, takes readers on a nine-lesson journey through scripture to consider how God’s promise (“I will be with you”/”I am with you”) speaks to our circumstances, as individuals and a community. We will also consider Jesus’ own promise of presence to his followers as he sends us into this world. As we explore the many facets of this most profound gift, we will ask, how does God’s promise of presence change us and the way we live? This is the Spanish edition of the study.